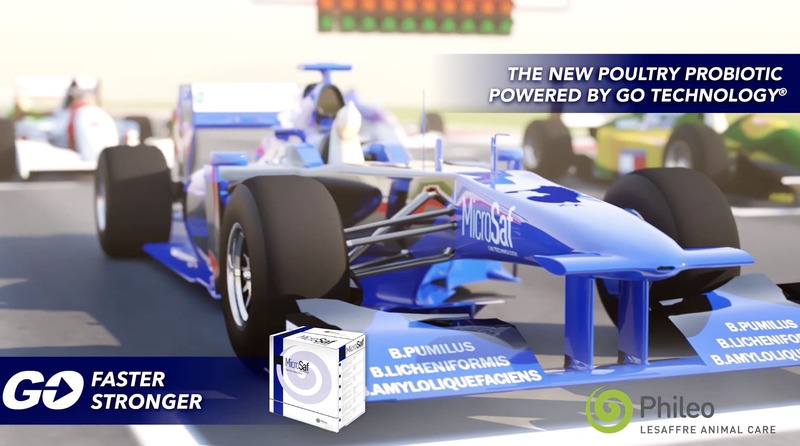 Do you want to learn more about Microsaf® ? Contact us! The performance of Microsaf® is enhanced by Germination Optimization Technology (GO Technology®),a new process designed to promote faster and stronger Bacillusspore germination. This maximizes the Microsaf® impact within the short transit time of 4-5 hours, which applies to most chickens. GO Technology® is an exclusive patented technology (US 9,447,376, US 9,932,543, EP 2,954,041). Microsaf® is a spore forming bacteria probiotic with a high resistance to feed processes, such as high-temperatures during pelleting or the heat treatment of mash feed. In-vivotrials carried out in different parts of the world demonstrate that supplementing birds’ feed with Microsaf® can help to mitigate the negative effects of nutritional challenge or necrotic enteritis caused by Clostridium perfringens. 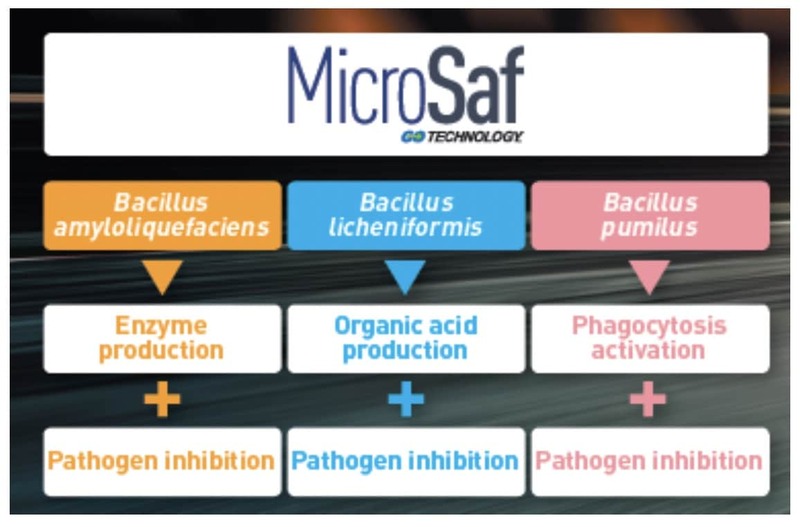 Compared in trials with two other Bacillus-based products, Microsaf® achieved higher levels of feed intake, improved FCR and the best return on investment (ROI). Microsaf® is the association of 3 Bacillus species selected through a battery of screening tests from a library of proprietary strains. By the prior placing of key germinants within the spore for faster activation, GO Technology® can accelerate and synchronize Bacillus spore germination and deliver probiotic benefits to birds more efficiently. GO Technology® has been developed to allow sporulated probiotics to germinate under challenging conditions due to the short transit time in chickens and to mitigate the negative impacts of acidic pH and bile salts which can delay spore germination. Comparing Bacillus spores primed by GO Technology® to ones which are not primed, showed that GO Technology® innovation successfully accelerated and synchronized the germination of the three Microsaf® strains. This enabled primed Bacillus licheniformis spores to reach 90% germination in just 45 minutes, a level reached by only 10% of the spores in the control group. The information provided in this document is, to the best of our knowledge, true and accurate. However, products must only be used in compliance with local laws and regulations and we cannot guarantee freedom of use for every intended application or country.